APGPCET 5th Class Entrance test Online application form 2019 @ http://apgpcet.apcfss.in, AP FIFCAT 5th Class Admission test Online application form @ http://apgpcet.apcfss.in, Apply online for Social Welfare Residential Schools Common Entrance Test 2019 http://apgpcet.apcfss.in, How to apply for Gurukula Patashalala Common Entrance Test, Online applying Procedure for APswreis, APtwreis, APmjpbcwreis Gurukulams 5th Class Admission Test 2019, how to fill the http://apgpcet.apcfss.in application form, Step by step online applying procedure for APGPCET 5th Class Entrance test. 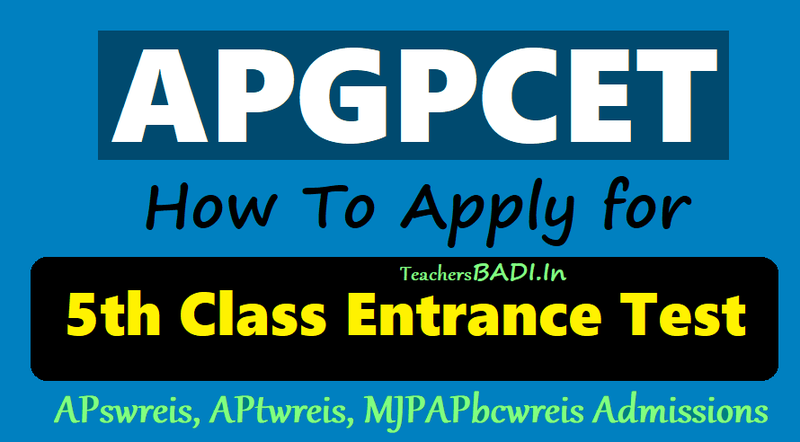 APSWREIS has announced GPCET 5th Class Entrance test 2019 notification on 23-01-2019 and Online applications are inviting from the eligible students for admission into 5th class in APswreis, APtwreis, APmjpbcwreis, APreis Residential Schools for 2019-2020. APGPCET Admission test for fifth class admissions in ap welfare residential schools. 1. PERSONAL DETAILS: In this application form user can enter the Aadhar Number(UID) and candidates details will be uploaded like, Name of the candidate, Father Name, Date of Birth, Gender , Address for Communication, Pincode and remaining detail should be filled in this section. Details furnished in the application are final. Subsequent requests for corrections will not be entertained. After filling the form, Click on Preview Button and check it thoroughly. EDIT the form details if necessary and then only submit the same. After submission of application form at #APGPCET web portal, candidates can download the APGPCET 5th Class entrance test hall ticket by entering the Aadhar Number(UID) and mobile number. Note : Details furnished in the application are final. Subsequent requests for corrections will not be entertained. After filling the form, Click on Preview Button and check it thoroughly. EDIT the form details if necessary and then only submit the same.